HUNTINGTON, WV (HNN) - Super heroes soared into blockbuster status when Christopher Reeve took to the sky as “Superman” heralded by an accompanying ‘you’ll believe a man can fly. Since the contenders have been many, all hoping for big screen mega popularity. Superman had an advantage --- universality. Viewers required only minimal orientation to his “origin” on the dying planet Krypton. Similarly, they understood x-ray vision, Kryptonite fragments, his secret identity and his romancing of Lois Lane. 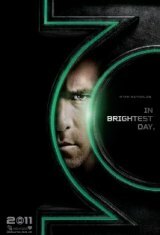 Hal Jordan (played by Ryan Reynolds) gaining extraordinary otherworldly power through a Green Lantern ring mostly fumbles its hyped potential. Scenes of Lantern guardians and re-cycled “Star Trek” small people aliens on a distant plant fail to pierce the necessary ‘believe it’ barrier. The heroes visits to this non-Avatar fare more as a CGI fairy tale. On the other hand, GL’s battles on Earth score, even when out will powering the relatively undefined black blob of space dust, Paralllex. GL’s powers depend on the ring and willpower. It’s hard to achieve any type of visual perspective for balancing of will power urges, except for some cartoonish-looking barriers and weapons . However, Reynolds does have a chemical reaction with love interest Carol Ferris (Blake Lively), yet, his rescue ‘powers’ display as only moderately imaginative (but cheesy ) cushions for breaking Lively’s plunges. Empathy levels break the “suspend disbelief” barriers, but the Lantern comic feasted on villains from outer space, not enhanced earthlings, such as Lex Luther or The Joker. While this introduction often drowns in CGI garble, the potential for a franchise exists --- but the green man needs personality embellishments and a director that doesn’t dash too often outside the Milky Way.